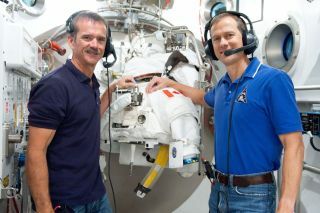 Expedition 34's Chris Hadfield (left) and Tom Marshburn will be the latest astronauts to perform Canadian aging research in space. These conditions are risks for any space traveler, but they're also problems facing many seniors living on Earth. To accelerate scientists' understanding of how the body ages, Canada's leading space and health agencies are pooling money and researchers, and plan to showcase the results of the research internationally. First spearheaded by the CSA's Nicole Buckley, chief scientist for life sciences, the partnership produced a national workshop in June. In the next couple of years, the Canadians plan to host an international working group to bring in research from NASA, the Japanese Space Agency and other government space stakeholders. Despite the initiative's youth, Buckley said the CIHR is excited about gaining more access to the station's orbital laboratory, where health research is performed by space residents. "There's increasing interest in the whole process of aging — pretty soon, we’re all going to be there — and we have this great resource in space that can complement terrestrial research. Why have it in two separate [research] areas?" said Buckley. "Richard is an example of a crossover scientist — a life scientist that does fabulous space research," Buckley said of Hughson. Hughson's speciality is aging, and his university is pushing hard to gain world-class speciality expertise in that area. Next spring, the University of Waterloo will break ground on a long-term care facility that will host 192 seniors in its first phase. The facility — the first of its type worldwide — will open its doors around 2014. Construction will cost $130 million Canadian (U.S. $132 million) over several phases. The first stage includes a privately funded $3 million (U.S. $3.05 million) research center next door. "It will allow us to test and monitor individuals more in their normal, natural daily setting," Hughson said. While seniors come into his lab regularly for blood pressure and stand tests, by the time they arrive, they've already been up for several hours and their body has adjusted to walking. "It's not the same as trying to catch someone in their home environment," he said. Additionally, Hughson just published several papers showing how long stays in space affect astronauts' hearts, and the crucial vessels that send blood to the brain. "We think — we're still in the thinking stage — what's happening is you damage the brain blood vessels to the extent that you have a reduction in total brain blood flow," Hughson said. He's now analyzing data from 100 seniors on Earth, collected in the past 2.5 years. "Our CIHR part of the funding has been looking at a fairly large group of elderly [people] to examine arterial stiffness and blood flow, and now to examine cognitive and motor function to see whether there is a relationship," Hughson said. "If we can learn something from the astronauts that we can apply back to the population on Earth ... that's really great," he said.